I accidentally made a HTC backup AFTER a hard reset. How to restore to the previous backup? 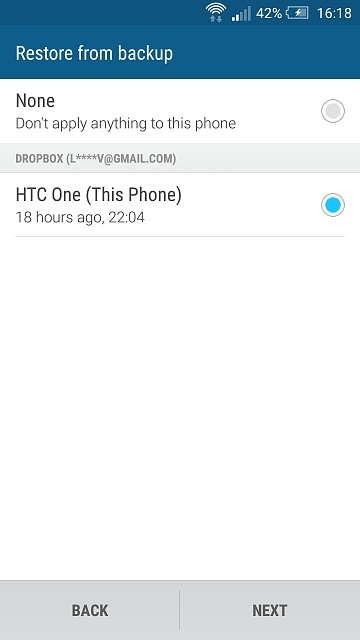 I backed up my phone on Dropbox with the HTC Backup app and then I did a hard reset. Instead of restoring the phone though I accidentally clicked on back up now and made a new backup. I recovered the files of the original backup from Dropbox, but the only option I get when trying to restore is to restore to the backup made after the hard reset. Is there a way to restore my data to the previous backup? I have all the files of the backup but can not seem to find a way to make HTC Backup use them instead of the new ones. Samsung 4 - photos duplicated at least 100 times...what is the problem and how to fix?